A growing number of entrepreneurs are turning environmental problems into opportunities to start fast growing businesses. 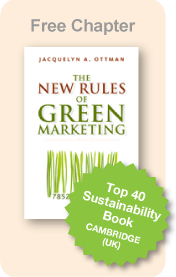 That’s the lesson discussed in the MSNBC article quoting green marketing veteran, Jacquelyn Ottman. Click here to read more or download the PDF.